The Bold and the Beautiful fans are all worried about Hope. Even her own mother is worried abut her this time around, and this is not good news. Her mother only worries about things when they are not going the way Hope wants them to go, but now she is worrying about her for other reasons. It’s all kinds of messed up and unhappy, and that’s all there is to it. We just don’t know if there is anything that might make things seem or feel any better, but what happens when we all get to see her lose it? Sally, on the other hand, was horrified when she learned that Wyatt told his father he would go back to work for him. She’s not amused by this, but shew as very touched when Wyatt gave her the news that his acceptance of this offer was nothing short of conditional. He will only return to his father’s employ if his father opens back up the Spectra Fashion house. He wants Sally to have a chance to get her life in order and to make things work, and this is what she is getting. She’s happy about that, of course, but she’s also going to get a chance to see things work in her favor. She’s touched, her man is happy, and everyone is in a good mood. Donna and Justin are even working together to find a way to get Bill and Katie back together now that her husband wants to annul her and move on with his own life. It’s a mess, but they might have something that will work going on. If they can get back together, though, we just wonder how long it will take until Brooke messes that up with her feelings for Bill? It’s happened before. He may have been here longer than anyone else, except Brooke, but he remembers where he came from and the people he worked with. Brooke is worried for her daughter. Hope has been doing very little else than pushing her husband to spend more and more time with Kelly and her new baby sister that Steff adopted. Hope wants to spend as much time with that baby as she possibly can, and Brooke is worried. For one, she’s not entirely sure her daughter is okay, and she’s worried about the amount of time she’s spending with this baby. Secondly, she’s worried very much about what is happening with the fact that her daughter is pushing her own husband to spend so much time with his ex-wife and their baby. Brooke can see a lot of bigger picture items happening around here, and she is not entirely certain she’s good with any of this. But, for now, there is very little that Brooke can do. Bill is going to make sure that Katie knows that she has someone she can count on in the wake of her husband announcing that he’s done and over all that’s their marriage. Bill wants her to know that she never has to worry he will leave their family or not support their dreams. He wants her to know that he is there for them, that he will do anything he can, and that he is going to change their lives for the better. She may not have a husband anymore, but she does have him. He feels that’s much better for her and for their son in the first place, and that’s all right. 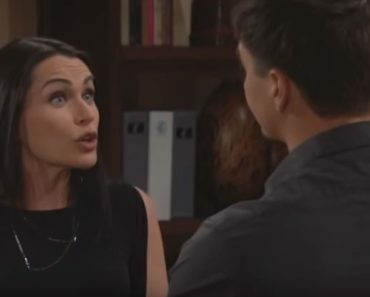 Stay tuned for more The Bold and the Beautiful and be sure to check out TVOvermind daily for the latest The Bold and the Beautiful spoilers, news, and updates.